This is an interface module for my ARP-3604 keyboard. It consists of multiples with 1/8" jacks (for the ARP and to daisy chain to my Odyssey / Avatar) and 1/4" jacks for CV, Trigger, and Gate. The CV jacks allow connection to the JLH-822 V-Shift module on the left prior to two sections of multiples. 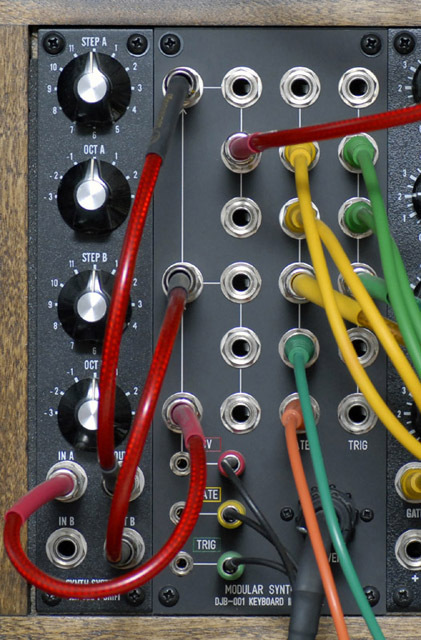 The module also provides power and signal connections for the Arp-3604 keyboard.